I am starting the year with a Soup Series on Where Is My Spoon. Many people make New Year’s resolutions and many of those resolutions have to do with eating healthier, maybe loosing some weight, getting fitter and so on. I am not much into making resolutions myself, because I realized long ago that I am not disciplined enough to keep them on the long run, so I just take things as they are and know for sure that what food and fitness are concerned, this year will be same as the years before. But no matter how much I enjoy a cake full of whipped cream, I dearly love soups as well. We eat soup at least twice a week, very often this Romanian Chicken Soup with Semolina Dumplings, but lots and lots of other soups as well. We all love soups in our family and if I make any, any kind actually, I am sure that everybody will be happy. 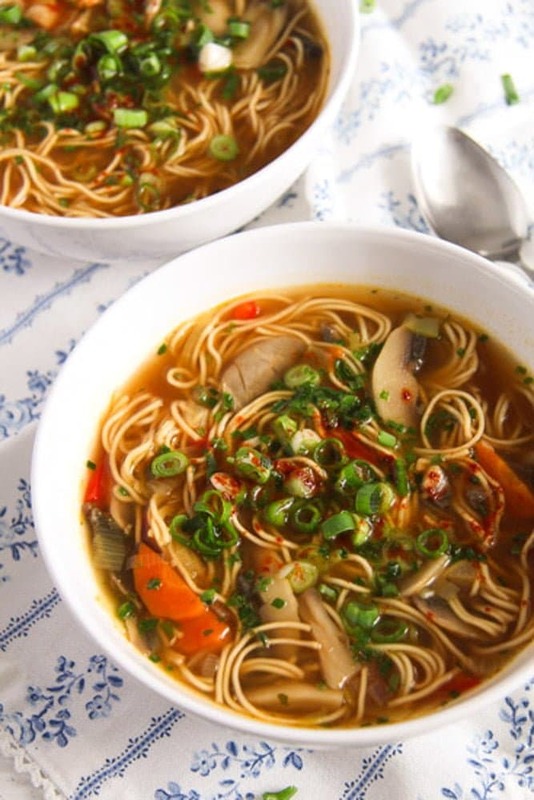 Today’s soup – the Quick and Spicy Mushroom Noodle Soup – is a very easy to make, delicious and totally satisfying little soup with a Chinese touch. 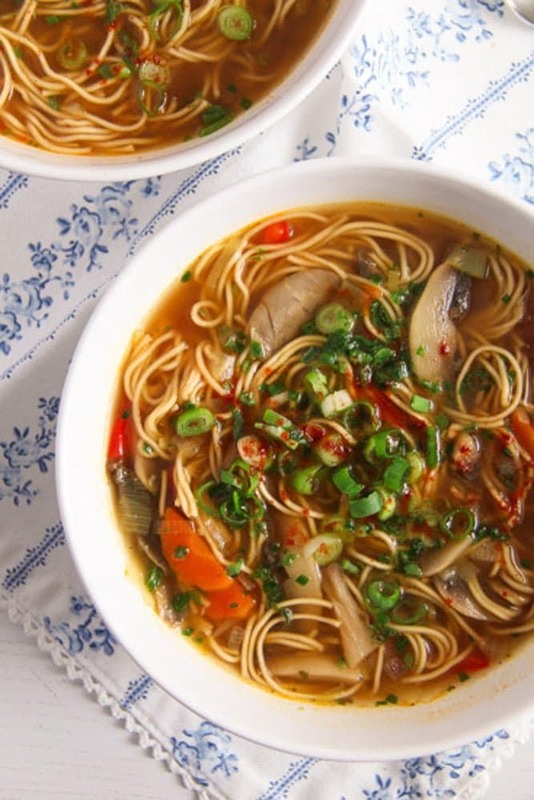 It is not an original Chinese recipe, it is something I came up with, but I used some ingredients that could justify calling this soup Chinese. 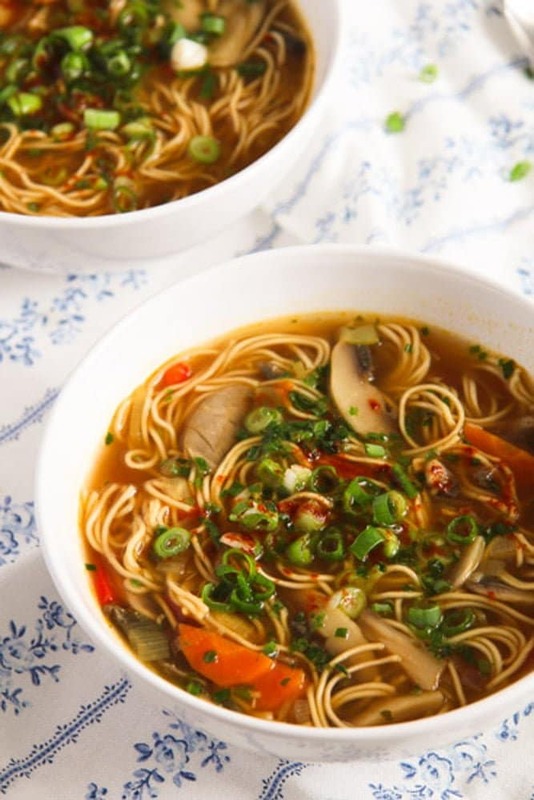 So, in case you are in the mood for a spicy, healthy and filling soup, do give this Quick and Spicy Mushroom Noodle Soup a try. Chop the onion finely. Slice the carrot, cut the leek into thin rings and the red bell pepper into small stripes. Heat the oil in a soup pot and fry the onion until translucent. Add the chopped vegetables and cook, stirring for about 3 minutes. In the meantime slice the mushrooms. 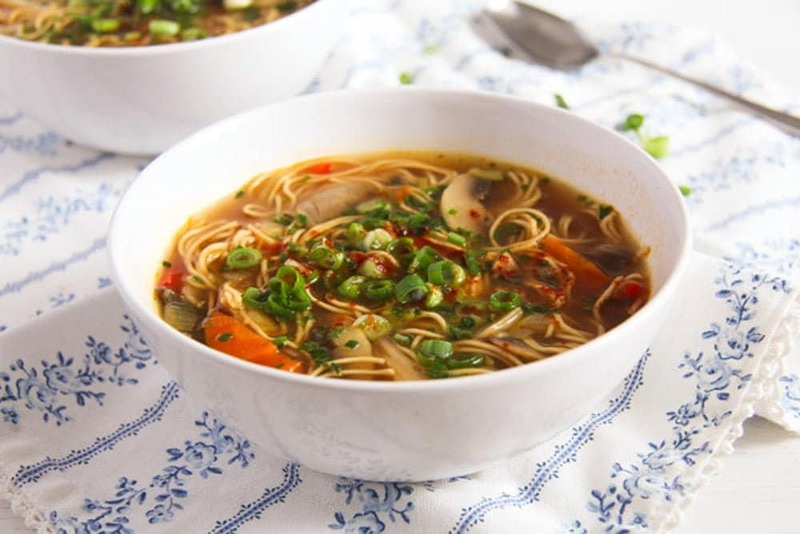 Add the garlic-ginger paste to the soup, stir well, then add the vegetable broth, sliced mushrooms and sambal oelek. Simmer for about 7 minutes. Give the hoisin sauce, fish sauce, soy sauce and noodles to the pot. Cook the noodles in the soup according to the packet's instructions or until done to your liking. In my case, the noodles had to be cooked for 4 minutes. Slice the scallions thinly and give them to the soup. Serve immediately. This sounds delicious with all the good seasonings you have added to the soup. Hi Allie. Happy New Year! I bought the garlic ginger paste in an Asian shop, far away from here, it is a wonderful condiment, I love adding it to soups and curries. What a fabulous soup! 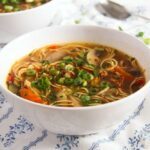 Love the combination of vegetables and egg noodles are my favorite! Can’t wait to see the other soups you share. Happy 2018!